Poised and ready, the U.S.S. Bataan welcomes Salmagundians with a VIP tour during Fleet Week 2016, courtesy of the U.S. Coast Guard and COGAP. Here are some photos of encountered ship board moments. 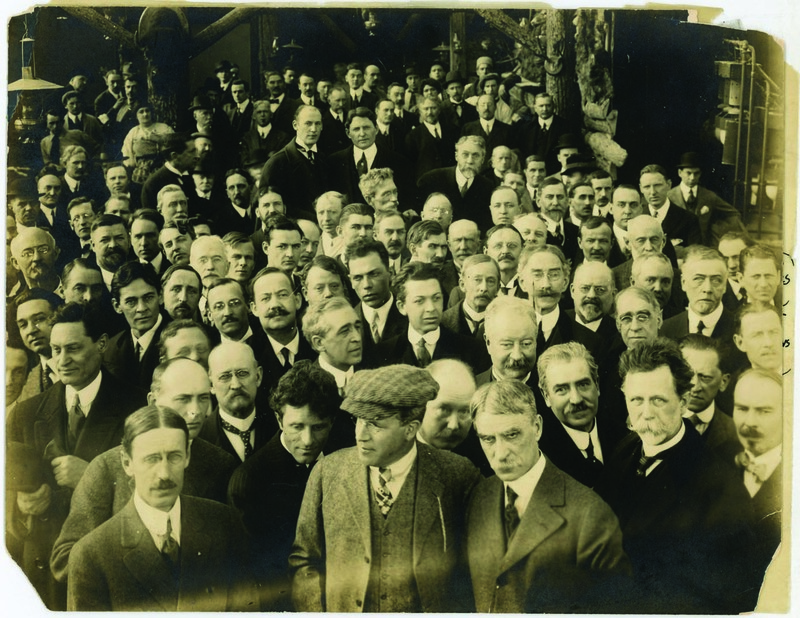 Salmagundians visit the Vitagraph Movie Studios in Flatbush, Brooklyn on March 30, 1915. The Curators Committee, aside from researching, documenting and preserving the Club’s art collection, also oversees the Club’s historic photographic archives. In the process of digitizing some of these photos, an image was found of a large group of Club members labeled on the back in pencil “Visit of the Club to Commodore Blackton’s movie studios, Brooklyn in about 1916 or 17.” What follows is a bit of long forgotten Salmagundi history. Today we take movies for granted, with their special effects, 3-D animation and the ability to transport us to amazing alternate realities. But one reality remains the same, visual artists of myriad disciplines have always been essential to the cinematic process. It’s hard for us to imagine that only a century ago, Hollywood was a fledging industry and movies were not only exclusively in B&W, but silent as well. 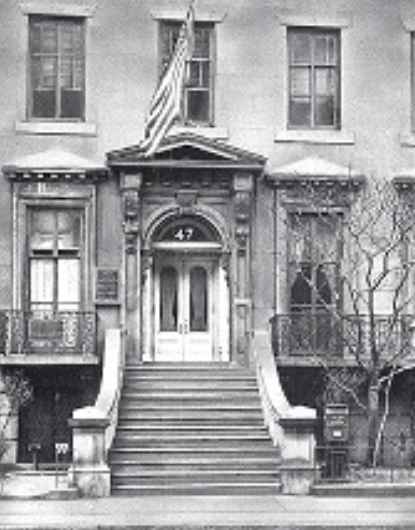 Among the pioneers of the early film industry was Commodore J. Stuart Blackton, an artist and illustrator who was elected an artist member of Salmagundi in 1914. Blackton was known to have put on moving picture entertainments at the Club on a number occasions, all of which were well received. His life and innovative technical achievements are a fascinating story and warrant further study. “A group of dancing nymphs, tiny figures in gossamer draperies [flit] like moths in cool shade. 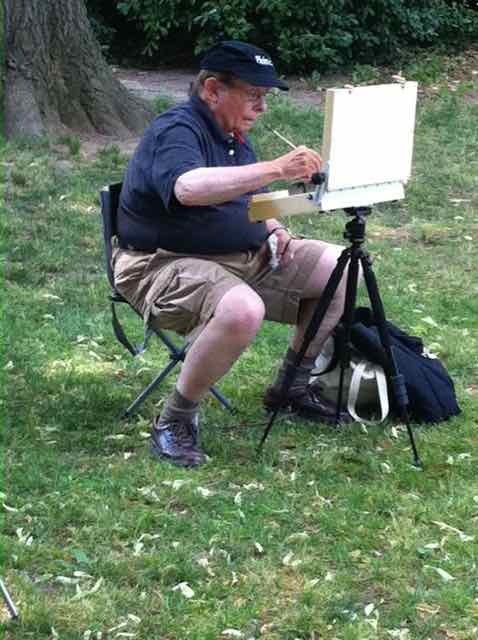 The painting was photographed on panchromatic negative. A second negative was taken of a group of Isadora Duncan dancers, softly lighted against a black background, the living dancers in the same relative position as the figures in the paintings. These two negatives were printed together on one positive film, toned sepia and tinted a delicate green, the two groups of dancers blending one into the other. At first the effect on the screen was a Corot painting, then the living figures began to move in a graceful dance which increased in tempo, then slowed down until the living forms again became stationary. It is likely that, rather than “Spring” or more appropriately, “Printemps,” the painting Blackton used for this film would have been Corot’s “Une matinée. 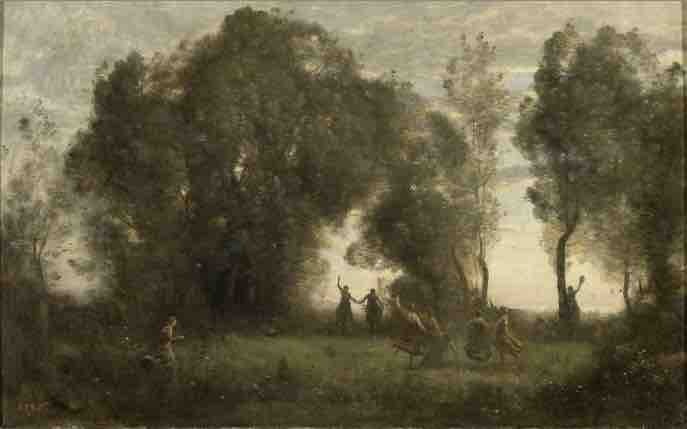 La danse des nymphs” of 1850 in the collection of the Musee d’Orsay. The minutes from the General Meeting of April 2, 1915 confirm this: “Immediately after the meeting Mr. J. Stuart Blackton took command, and for two hours entertained the members with moving pictures of remarkable interest and beauty. Among them, and perhaps not the least appreciated by the members was the picture made of the Salmagundians on their recent visit to the Vitagraph Studios. While some questions are answered here, still others are raised. 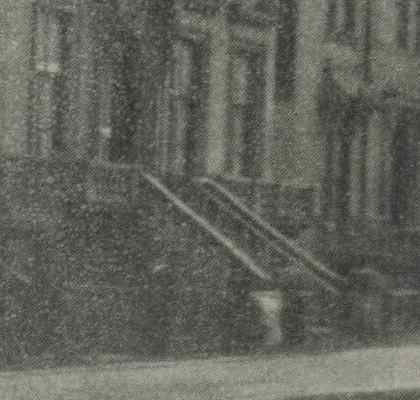 In any case, this century-old photo helps to link us to the earliest Club related film. It is hoped that the footage still survives in some archive and that we might some day have the pleasure of viewing our forebears in a candid moment of shared Club Spirit. F. Ballard Williams (President), Commodore J. Stuart Blackton, Joseph Isidor, G.H. Frohmmann, Harry Townsend, Guy Wiggins, Ernest L. Blumenschein, Dave Robinson, Stan Hagar, Ward N. Hayes, Franklin DeHaven, George Reevs, Raymond Perry, Edward A. Quin, Charles E. Chambers, Walter Biggs, Carl Rungius, William Henry Shelton, C. H. Sherman, Galen Perret, Peter Newell, Charles L. Barstow, William Ritschel, Ernest David Roth, Philllip .J. Ross, Albert M. Garretson, William Bailey Snell, Frank Tenney Johnson, Robert Vonnoh, Arthur Litle, William Henry Howe, Eliot Clark, Jerry Waltman, Bruce Crane, John Ward Dunsmore, Francis Luis Mora, Walter Granville-Smith, Cyrus B. Currier, William McGregor Smith, Carleton Wiggins, Orlando Rouland, George Elmer Browne, Benjamin Eggleston, Leo Mielziner, Walter Douglas, J. Francis Murphy. 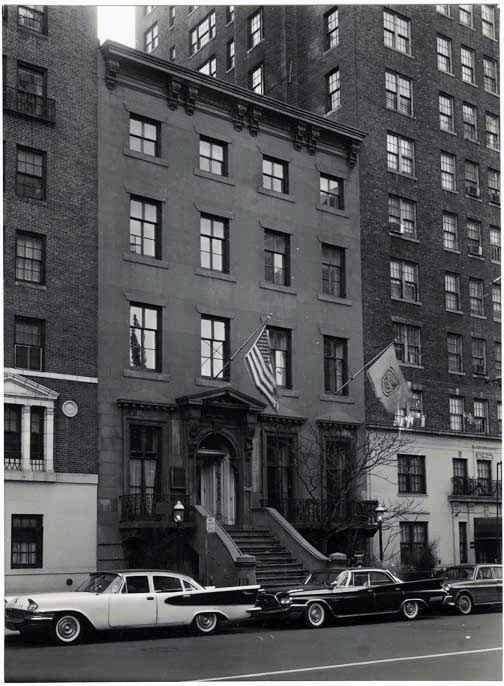 While the Club undergoes several major internal reconstructive surgeries in anticipation of its 2017 centenary at 47 Fifth Avenue, this is as good a time as any to look back at a few of the external facelifts that have taken place during the 161 years since this double-wide wood frame townhouse was built for Pennsylvania Coal Company President Irad Hawley and his wife Sarah in 1853. The side facing the avenue is ornamental, not structural. 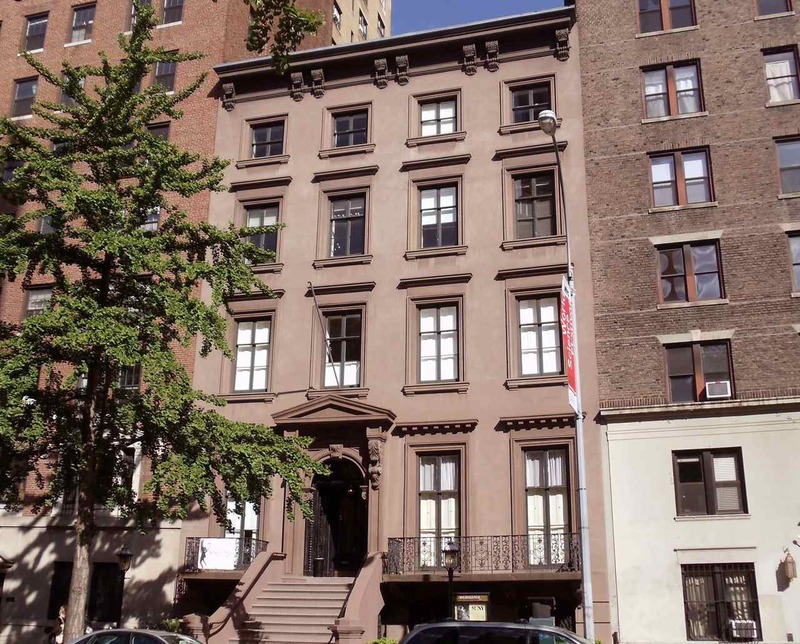 Brownstone was used for all the original Italianate style features including facade, balconies, staircase and balustrades. Not the strongest or longest lived of building materials, over time all of these elements would have to be refaced or replaced. In an online game of “Photo Hunt” we’ll try to put together a “what and when timeline” of the changes. Let’s start with an image (top left) that comes from a 1911 collection called “Fifth Avenue, New York, From Start to Finish”. This book is a highly revered compendium of panoramic photographs of Fifth Avenue. At a mere 58 years of age, and not yet in the Club’s possession, Number 47 appears in all its (original) brownstone glory. Note the absence of gas lamps. They came much later. The staircase and its balustrades would be among the first to vanish. A side-by-side closeup comparison (above) of the 1911 image to Berenice Abbott’s classic 1937 photograph shows the stone replaced by, or encased in, a more imposing poured concrete superstructure (which is still with us today). The banisters are polished brass (those are no longer with us). Another photo (below) from roughly the same time period offers a wider view of this same renovation. Not only has the stoop been altered but the facade as well. The front wall is clad in a brown colored stucco with a cinderblock pattern chased into it. The triangular parlor floor pediments, stone balconies and other balustrades have been left in place, but the second and third floor window embellishments are greatly subdued. Our gas lamps have yet to sprout. By 1960 (above), the triangular window pediments on the parlor floor have been exchanged for linear ones. This was not a total facade redux since ghosts of the former triangles can be seen above the windows (above and right). 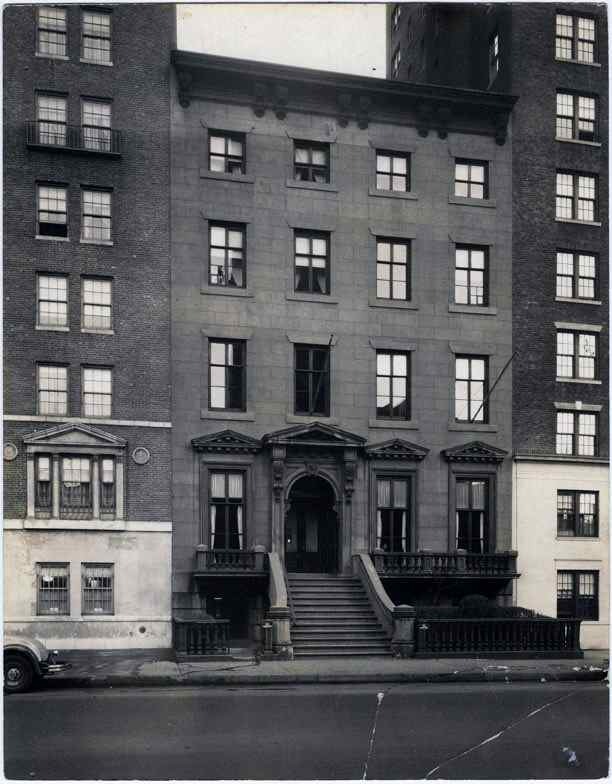 A closer inspection reveals that the balconies are now concrete and the stone balustrades, so prominent in Berenice Abbott’s photo, have turned into wrought iron. Our now-ubiquitous gas lamps have been planted in the garden, perhaps in exchange for the lost stonework, thus completing the transition. 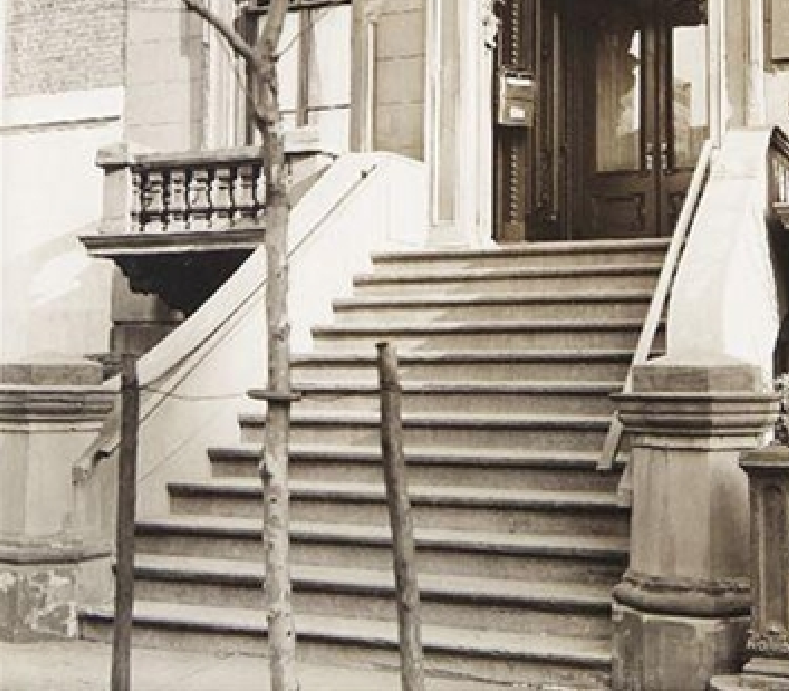 In the early 1990s, following numerous cycles of theft and replacement, our polished brass banisters were reluctantly switched to wrought iron too. The last pair were taken just two weeks after being installed. On their final visit, the thieves, eyeing new black banisters, scratched the ends just to be sure we weren’t concealing more brass with a layer of paint. In 1996, following decades of deterioration, interim refacings and stopgap repairs, and with a scaffolding shed many thought was permanently installed over the sidewalk to protect passersby from falling chunks of stucco and a badly sagging cornice aching to let go, Larry Burda, a NYC restoration contractor specializing in historic and landmarked brownstone properties, was engaged to totally strip the front of the house and bring it back to a more cohesive look. This current (1997) iteration (pictured above) restores more prominent lintels to the upper floor windows. On the parlor floor, it was decided that in the absence of the elaborate stone balustrades, linear window lintels would be preferable to the heavy triangles. Other non-structural elements replaced during this update include the roofline cornice and decorative covers for the cantilevered balcony support beams. Irad and Sarah Hawley’s home is more consistent in appearance now than it had been over the preceding 75 years. Current restoration efforts have turned inward, with repairs and upgrades planned for rooms, hallways, floors and galleries. Less obvious but even more critical are the building’s aging mechanical systems which are also being overhauled – all this in preparation for Salmagundi’s 100th anniversary as custodian of the extraordinary house at Number 47. 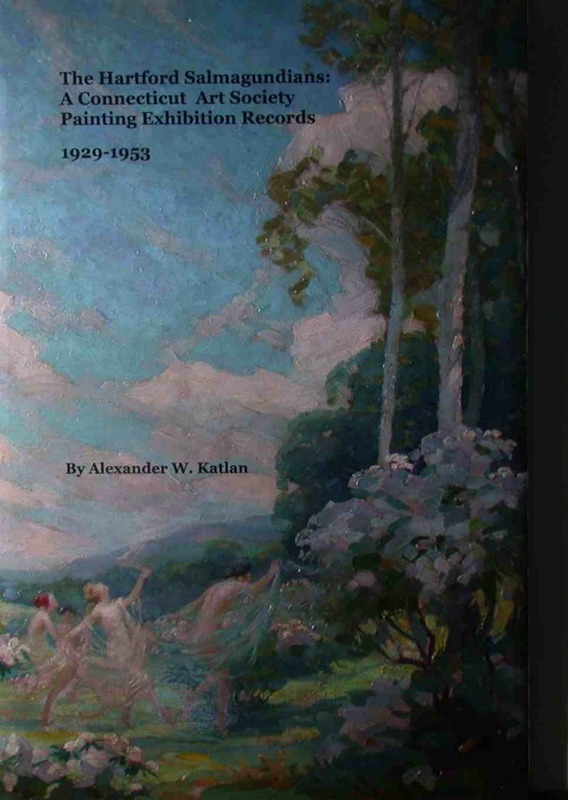 The Hartford Salmagundians: A Connecticut Art Society Painting Exhibition Records 1929-1953 is the latest work from Alexander W. Katlan pertaining to the Salmagundi Club and its members. A book launching / signing event is scheduled at Salmagundi on Tuesday, November 12th at 7:00 PM. This is the first book chronicling the Hartford Salmagundians art society formed in 1929, a satellite of the historic New York Salmagundi Club. Throughout their existence, the Hartford Salmagundians’ shows were exhibited at the Wadsworth Atheneum Museum of Art in Hartford, Connecticut. This publication includes a preface by Claudia Seymour, past president Salmagundi Club (2007-2013), a discussion of the Revival of the American Realist Tradition, and an introduction to the Hartford Salmagundians by the author, a brief discussion of the Salmagundi Club of Louisville, Ky., Salmagundi Club of Sacremento, Ca., Salmagundi Club of St. Louis, Mo. and the New Haven Paint and Clay Club. The volume further contains a listing of exhibition catalogues and committee membership of the Hartford Salmagundians, a list of the artist members of the group, a selected list of N.Y.C. 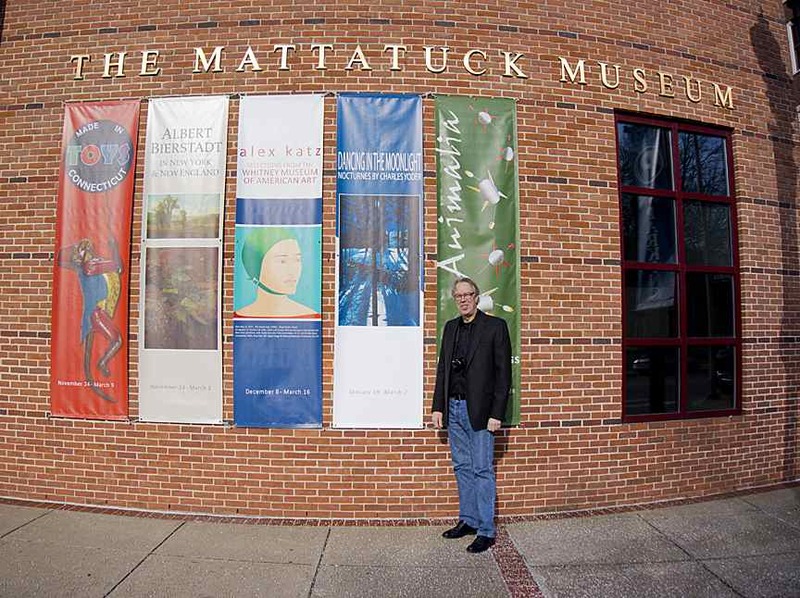 Salmagundi artists exhibiting in Connecticut, a directory of the Painting Exhibition Records of the Hartford Salmagundians, and a final comment by the author. This unknown painting exhibition history has been chronicled and indexed making available the artists, actual titles of the paintings, dates when these artworks were exhibited, and prices when available. A list of artists exhibiting in the Hartford Salmagundian exhibitions are: Edward N. Allen, Harry Russell Ballinger, George Elmer Browne, Winfield Scott Clime, Harry Farlow, William Bradford Green, Eugene Higgins, Henrik Hillbom, Albertus E. Jones, Walter O.R. Korder, Stanford Low, James Godwin Mcmanus, Carl Ringius, Paul Saling, Frederick Lester Sexton, H. Hilliard Smith and Guy Wiggins.